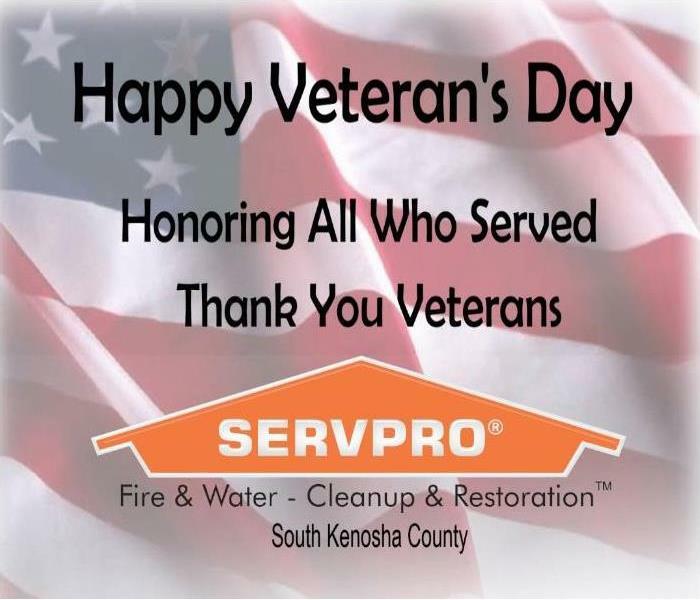 Here at SERVPRO of South Kenosha County, we are more than just a restoration company. We are here to help educate the community. To us, it’s about showing homeowners and business owners what they can do if a natural disaster were to strike. We try to keep up on giving tips to help prevent such tragedies. If you are to fall victim of such an event, we are here to respond as fast as possible. Always educating customers along the way throughout the whole process. If you have questions about a funky smell in your house or are just curious about what we do... give us a call! We are always here to help and be there for everyone. WHY SERVPRO?..... Because we are more than just a restoration company, we do it all. 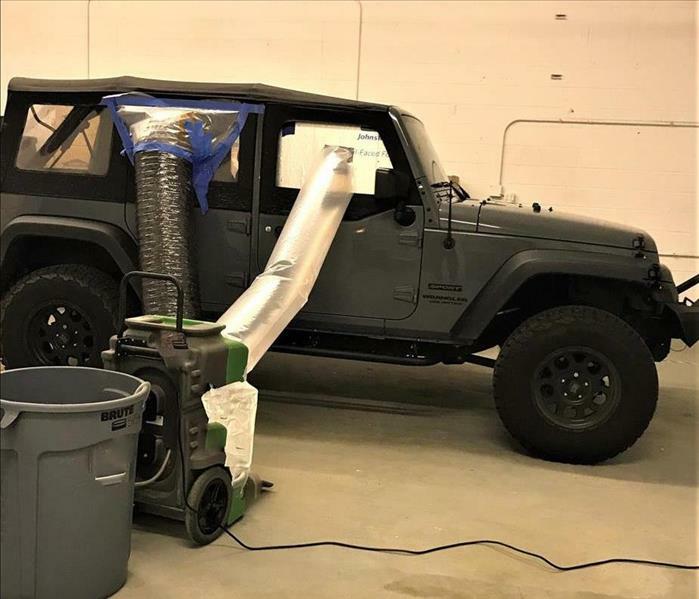 Here, we have a jeep that has a saturated floor board cause from rain water seeping in. What we are doing is pulling that moisture out, so the floor boards don't rot out due to excessive moisture trapped under the rubber mat. We are using a dehumidification process pushing heat in and pulling out the moisture. Please contact us if you find yourself in an odd predicament. We've even removed gas odors! Give us a call (262) 332-7044. This commercial property unfortunately fell victim of a water loss. 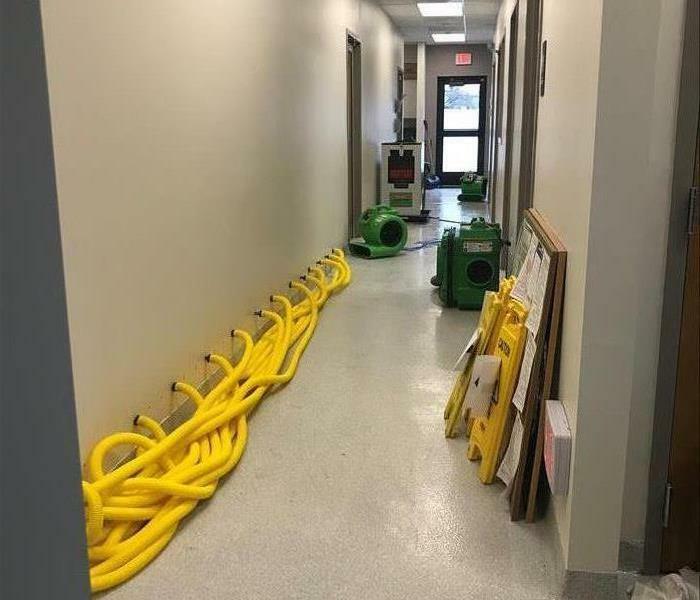 While company renovations were on way, another contractor used the water spicket outside of the building. After leaving the lines and spicket unwinterized, the clinic came back to a mess on the floor with highly saturated walls. ?? BUT, they knew who to call. SERVPRO of South Kenosha County was on it right away to get the walls properly dried out so there would be no further secondary damage. Be prepared and ask us about our Emergency Readiness Program (ERP). We will get your business prepared, so if a natural disaster strikes, you'll know what to do and who to call. 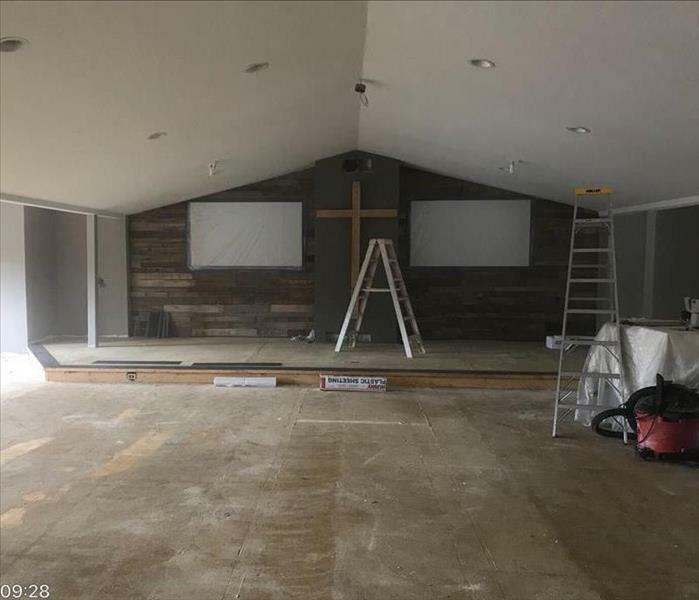 After taking care of this place of worship, they quickly got to resume worship and praise. Our team at SERVPRO is always looking to get everyone back in their property as soon as possible to make it most comfortable to them. No one is expecting a disaster to strike. 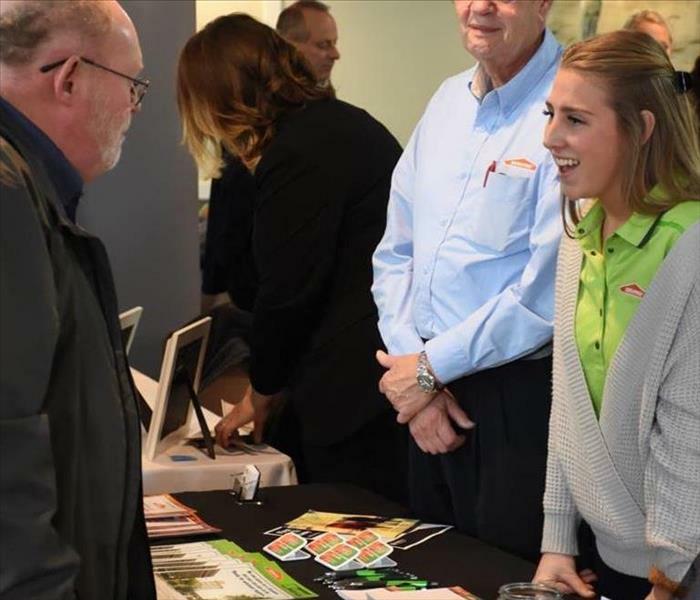 If something unexpected happens to you, CALL SERVPRO SOUTH KENOSHA COUNTY! Most of us forget to check the attic because we don’t keep common household items up there. 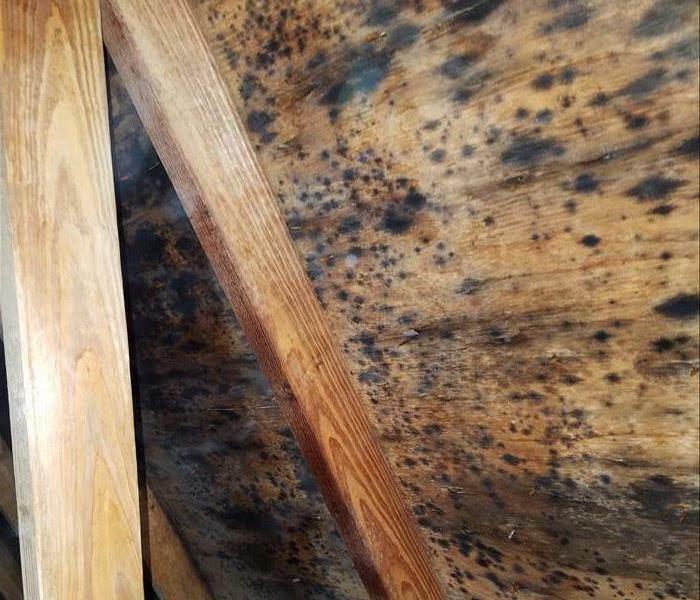 This homeowner had a surprise when he went into his attic. Fortunately, he knew who to call... SERVPRO of South Kenosha County! We were there to help provide microbial growth removal. It’s a good idea to check on the attic occasionally. Be sure that your house is secure of cracks or leaks, no one wants microbial growth in their home. If you have questions, CALL US TODAY! It all started when the weatherman forecasts heavy amounts of rain last week in the Southern Kenosha area. 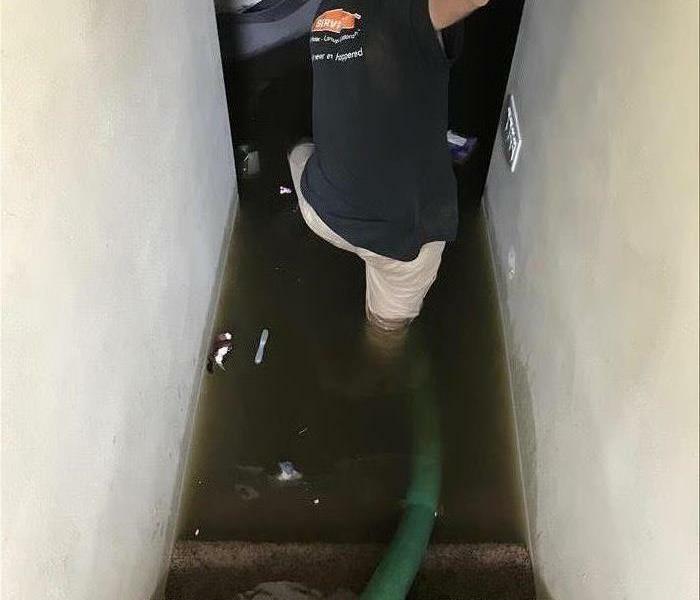 This Pleasant Prairie homeowner was very worried when he went to his basement to see what seeping up the stairs. This sump pump failure caused it to leave 3 stairs underwater with about 2 feet of standing water in the whole basement. We extracted the water as soon as we could to get this family taken care of and get their child back playing in the basement. Unfortunately, they weren’t the only homeowner to go through this. We were back logged with multiple calls during this flood run, but SERVPRO of South Kenosha County was here to help be the heroes we are. Taking care of those who were affected by the storms. These Twin Lake homeowners walked into their home to come to find out that their ceiling busted through, with water everywhere. They were in a panic when they found this and called SERVPRO South Kenosha County to get it handled. This is the aftermath of our client’s home when the water was left running in the upstairs sink. Unfortunately, this is a second home for the homeowners, so they did not catch this mess until a week had gone by. Since the water overflowed from the upstairs bathroom, it affected the upstairs and main level, all the way down to the basement. The heavy amount and force of the water caused this ceiling to cave in and break through the ceiling drywall. 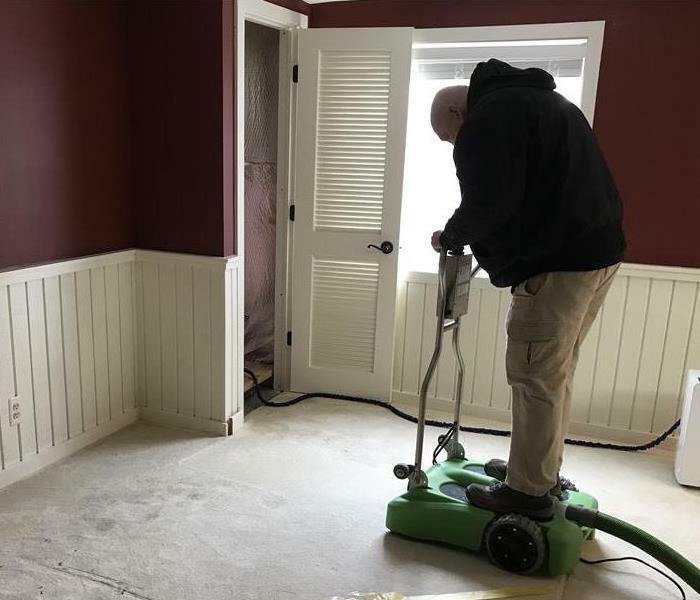 SERVPRO of South Kenosha County was there to help remediate right away. Call us today if you run into these unexpected issues. This was the aftermath of a bedroom fire in Kenosha, WI when we arrived on the scene. There was significant smoke and soot damage in a majority of the rooms in the home. 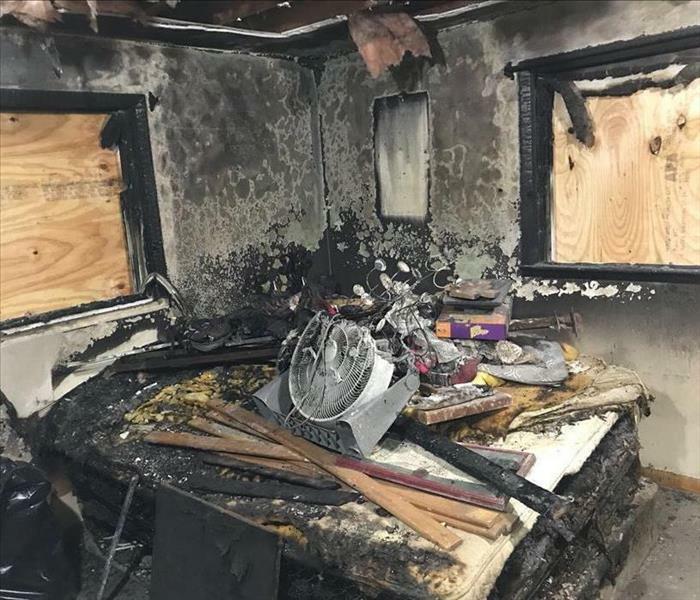 The fire was caused by a cigarette that was left burning. With the homeowner being displaced, she couldn't believe how quickly and we were able to clean and create a safe structure for her home. With the extensive damage, she was happy to recover her valuables and memorable items. We make disasters "Like it never even happened." February 3 we received an emergency service call from the facilities manager requesting help when this assisted living building starting flooding. SERVPRO of South Kenosha County was there right away to help get all of these residents back into their homes as soon as possible. Thanks to our great response time, we were able to get 73 of 75 residents back in there place the NEXT DAY! AWESOME JOB TEAM! Contact us if you're ever in an emergency situation. 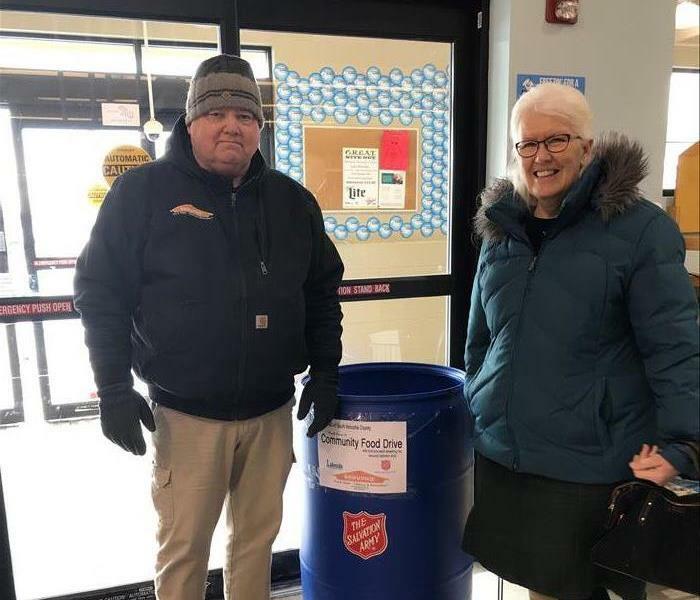 Owners, Mike and Kathy Oremus, donating at Lakeside Foods in Paddock Lake. Unfortunately, the Salvation Army of Kenosha was shorted on their food grant that usually comes in every year. We reached out to them to see if there was something we could do to help. When your county is in need, we're there to help as best we can. This winter we have had some crazy weather, temperatures rising and falling drastically. This has affected many South Kenosha homes this season, but SERVPRO of South Kenosha County is here to help get your home back in working order. Our Rover machine helps us extract water from carpeted areas. Owner, Michael Oremus, hopped up and started extracting from one of our customers home. Take the day to appreciate those who have and are serving our country. In honor of all the men and women who served and continue to serve, we want to thank you. Happy Veteran's Day! God bless you and God bless America. In the middle of September we deployed a crew down to Florida to help the victims of Hurricane Irma. 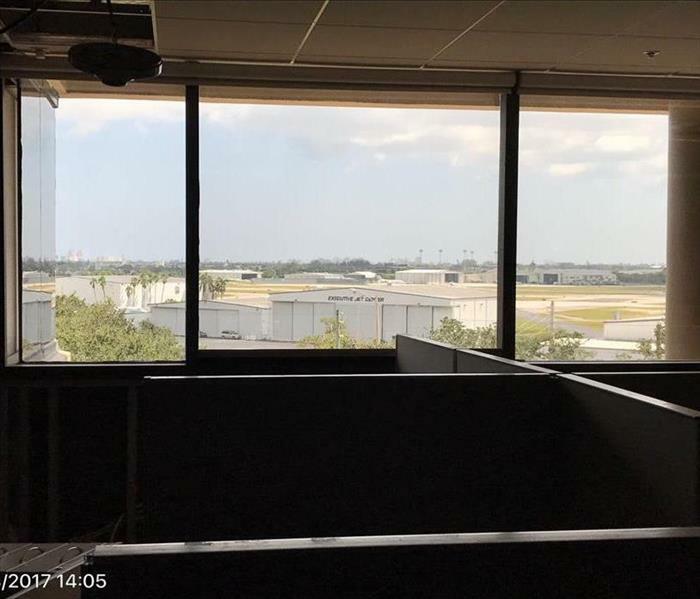 One business was in need of getting their office back up and running to continue work and we were there to make it "Like it never even happened." 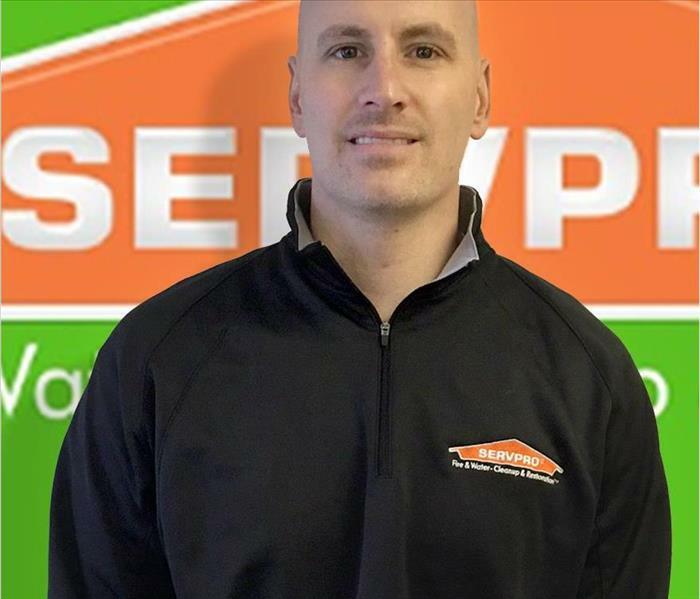 Eric is the Production Manager at SERVPRO of South Kenosha County. Eric is available 24 hours a day for emergency services. Eric has vast experience in the industrial, residential and commercial cleanup and job assessment. Eric plays a key role in dealing with insurance claims on our job sites. Eric carries multiply certifications in water damaged, fire damaged, mold remediation,and OSHA construction and safety. His efficiency on jobs and willingness to go above and beyond for any customer has made him a leader within this company. Eric continues his education and training through the IICRC organization.